I’m writing a bit later than usual this week. Been busy. Out in the garden. Out and about. I’ve taken on a new rallying call… Carpe Hortus. Seize the garden. Go for it. Plant it, pull it, hoe it, do it. And that’s what I’m doing. 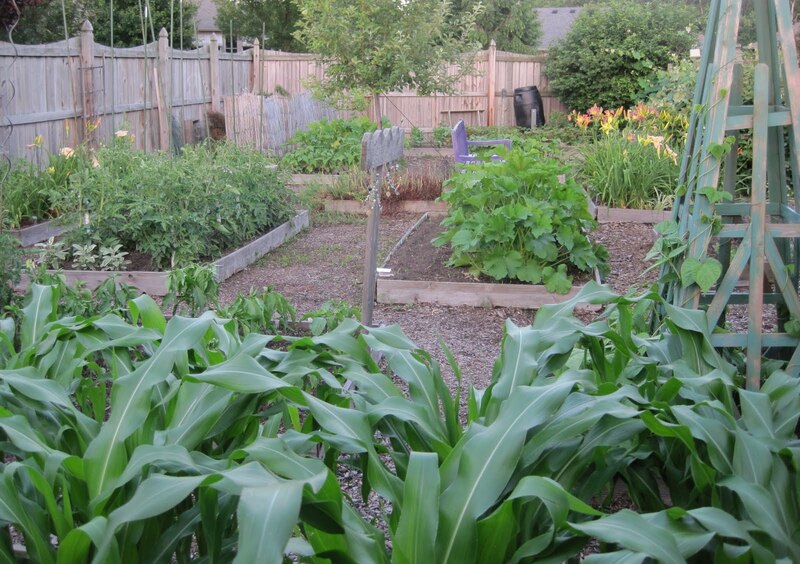 Out in the vegetable garden, everything is growing well, partly or mostly due to all the rain we’ve gotten. There are blooms on everything, but no squash or tomatoes or beans just yet. One of my co-workers is bragging about his tomatoes on the vine, but he bought plants already blooming, so I don’t count those as anyone’s first tomatoes. It is a whole ‘nother story when you grow them yourself from seed, nurture them along and plant them out in the garden in mid May! Here’s a picture of the vegetable garden from Sunday evening. Outside of the vegetable garden, the garden design continues to take shape, sometimes with big changes, like the day they planted three serviceberries to form a copse, and other days with small changes, like Sunday when I moved some perennials that were growing where there will be a grass path through two flower beds. Carpe hortus… I normally wouldn’t move plants at the beginning of summer, though I would buy and plant a plant if I found one I wanted. The ones I moved look like they are none too happy with the uprooting, but they’ll probably make it if we keep getting all this rain and I keep watering them in between all the rain. I checked in with the patio guy earlier today and they may actually start working on the patio later this week. I’m excited about that, and can’t wait for the patio to start taking shape. Soon I also hope to be figuring out the design for the gate leading into the vegetable garden so that can be installed later this year, along with more of the foundation plants around the borders in the back yard. Yes, indeed. Lots of changes in the garden, all for the good. Carpe hortus! Seize the Garden! P.S. 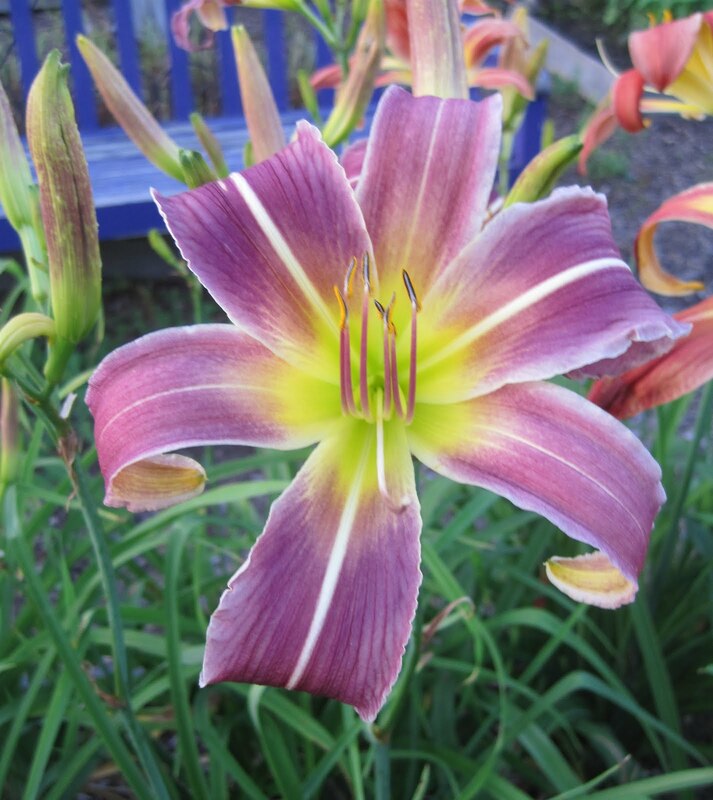 Pictured above is one of my spider-type daylilies, currently planted in one of the beds in the vegetable garden. Someday I’ll move this daylily out to one of the new borders, along with about 18 other daylily varieties growing in the vegetable garden, and reclaim that bed for vegetables. that sure is a gorgeous lily! I happened to notice some tomatoes growing today. It's exciting. I can't believe it's that time again. I've been carpe-ing hortus like a mad woman - and driving the family to carpe as well. Lots going on as we prepare for the Annual Rose Viewing on Sunday - but I am having to replant part of the vegetable garden. Deer, Rabbits and bugs! It looks so good Carol! Your spider type daylily is a pretty thing and my favorite color in those. Want me to pick up some more daylilies for you while I'm in St. Louis?